Welcome to Cube Town, home to all sorts of animals who all have one thing in common- their shape. Everyone is made out of cubes! This Canadian cartoon was based off of a children's book series. Join Pecola the Penguin and his pals as the search for lost treasure and more! At his friend Rudy's urging, Pecola attempts to break the current world record for most consecutive hours for twirling a yo-yo in the "Around the World" formation. Although everyone in Cube Town wants to support Pecola's bid for fame, they are afraid that he may be sacrificing relationships and shirking responsibilities in his quest for fame and fortune. ;Pecola has volunteered to be part of a dance troupe that is to perform at a festival in Cube Town, but he has procrastinated in his practicing and finds himself unprepared and unrehearsed... and the dance is tonight! Instead of working hard, like his friend Dr. Chu who is under pressure to design new fireworks for the festival, Pecola tries to find an easy way out with near disastrous results. Aunty Yorkshire is very excited when Pecola comes to stay overnight at her house. Her excitement soon turns to dismay as she finds that the activities she has planned for Pecola and herself turn out to be less than thrilling for her young ward. ;When Pecola and his pals Rudy and Coco stumble upon the entrance of what they think is an old cave, they decide to investigate. Unfortunately they neglect to tell an adult where they are going and find themselves lost and in a jam. Luckily in the end they are rescued by Mayor Papazoni... they have actually wandered into his secret "mayoral tunnel system"! Hillary leaves Cube Town for a business trip and Gazelle is upset about being left behind. He tries to lose himself in some fun at the beach, but manages to alienate everyone in town in doing so. Now he's really all by himself! ;It's Dr. Chu vs. Pecolius in Cube Town's first Yacht Race, with Little Chu as Dr. Chu's first mate and Pecola helping out Pecolius! The boys get swept up in the competition, so much so that they lose focus on what's really important, having fun and respecting your friends. Pecola and his pals find what they believe is an old pirate's treasure map buried on the beach and they are off on a treasure hunt. As the search intensifies the group comes to realize that finding the prize is secondary in importance to actually enjoying the search together as friends and as a team./n;The mysterious Al A Gator shows up in town and suddenly everyone in Cube Town is talking about this intriguing fellow...and ignoring Pecola. Pecola wants the spotlight back, so he decides to don a raincoat and carry a briefcase just like Al A Gator and put a little "mystery" into his life as well. He attracts attention all right, but a little too much as he uses his camera to take pictures of the locals and they resent having their privacy invaded! In the end Pecola learns a lesson about respecting the privacy of others and the townspeople learn a lesson about trust and openness. Pecolius, research in the library leads him to believe that humble Mr. Puggalski is actually descended from royalty and is a Prince! Pecola thinks this is great news and soon the town is celebrating and somewhat exploiting their native son's new found fame. Humble no more, "Prince Puggalski" soon develops a swelled head that threatens to take over the whole town. ; Mayor Papazoni decides that a new paint job on Town Hall would help attract more citizens to listen to his glorious speeches. When the painter fails to show up, Pecola takes the job upon himself and although he has the best intentions the job proves to be too much for him. In true Cube Town fashion, everyone pitches in to finish the job, with vibrant results! Rudy is Pecola's friend but he can be a handful. He brags constantly, he's kind of rude and very self-centered. But when his personality traits are copied by Dr. Chu's robot, Robo-Pecola, Rudy gets to see first-hand just how annoying he can be! 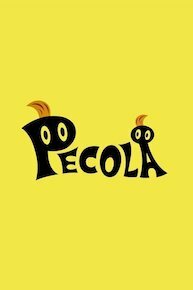 ;Pecola finds Pecolius? old movie camera and with Miss Lucky's help decides to make his own movie! Everyone in town wants in on the act, but they soon find out that the glamour of film making isn't all that it's cracked up to be...it's hard work! Pecola's favourite TV super hero is a cartoon character called, Power Chum. Pecola decides that Cube Town needs a super hero of its own and he is just the penguin to fill the job. Donning a mask, he turns himself into "Power Pecola" and sets out to save Cube Town...but from what? It turns out that what the town really needs to be saved from is... Power Pecola himself! ; Pecola helps organize a "Career Day" at Town Hall where various members of the adult community come to talk to the kids about their interesting careers. However once they begin speaking, each of the adults begins to feel that perhaps he or she is actually a failure. It's up to Pecola and his pals to reassure the adults in Cube Town that the kids think they are the best at what they do anywhere. When Professor Hornbender, the local astronomer, mistakes a voice from Pecola's walkie talkie as a signal from visitors from outer space, Pecola decides to let him believe it. He even convinces his pal Chewy to dress up like a Spaceman and pay Cube Town a visit, with very bizarre results. ;Everyone in Cube Town is painfully aware that Coco loves to sing, because unfortunately... she sings really badly. When she auditions for Pecola's band, he has to reject her but he also encourages her to keep practicing. She does but to the point of getting so hoarse she develops a great deep bluesy voice that everyone loves...except maybe Coco? After Pecola and Little Chu see a scary movie at the Cube Town Cinema, Pecola really lets his imagination run away with him. He feels that a statue which Pecolius has unearthed is actually cursed just like the one in the thriller movie that he and Chewy saw! Pecola decides to save Cube Town by getting rid of the statue and creates a thriller of his own...although some people are less thrilled with his actions that he is...;When Rory, Cube Town's dedicated postman, catches a cold, Pecola volunteers to take over his route. Rory agrees but insists that Pecola follow his instructions on how to deliver the mail. Pecola does at first but soon decides that he has some new ideas that will improve mail delivery in town. Pecola's changes soon wreak havoc all over Cube Town. The penguin acquires a new respect for learning from the experiences of others. During a heat wave in Cube Town, Pecola, Coco and Chewy decide to head for the snow-filled Glacier Valley to cool off. Things heat up though due to Coco and Pecola's constant "one-upmanship" and competitive natures. It is only when their snowman-building competition nearly causes a disaster in Cube Town that the two friends realize that while some competition is a good thing, too much can be disastrous. ;Pecola and his pals set out on an expedition to locate a prize that has eluded his grandfather Pecolius for an entire career...an encounter with the legendary Yeti of the Rookery Mountains. The kids fail to locate a yeti, but they learn that sometimes persistence and determination are their own rewards. Mrs. Bernard has finally had enough of her sleeping husband never doing any work. She's leaving and never coming back. Pecola and Coco decide to help Mr. Bernard by making a batch of cookies. Except they didn't quite follow the recipe and the cookies explode out of the oven, putting a hole in the wall of the bakery. Never mind that they're hard as rocks. But Pecola and Coco don't give up so easily. Baking bread is next. There's just one little problem. The bag of flour they bring up is actually cement. So the bread looks great but it's as heavy as bricks. Hey, that's just what the Bernards needed. The hole in the wall gets fixed in an especially bakery-ish way. ; It's time for Cube Town's annual 'Hide and Seek' competition. Will Mr. Puggalski win yet again? This year there is a new player in the game, the mysterious Al A Gator, complete with camera and briefcase. And Pecola is "It". He manages to find everyone but Mr. Puggalski. Everyone figures Mr. Puggalski has found the best hiding spot of all - inside Al's briefcase. They're off in hot pursuit of Mr. Gator, determined to find Mr. Puggalski. They think they've lost him when Al jumps aboard the ferry, but Mr. Puggalski turns up. He was in bed sick the whole time- and still managed to win the game. It's spring-cleaning day in Cube Town and Pecola wants to help. Never mind that Pecola's "help" isn't exactly wanted. But there goes a butterfly! It catches Pecola's attention and he follows the butterfly through Cube Town. But he's paying little attention to what's on the ground and causing even more of a mess. Paint splattered everywhere, watermelons smashed on the streets, and lots of dirty sheets for Aunty Yorkshire. Pecola promises to clean up the mess he's caused, starting with Aunty Yorkshire's sheets. He puts them all in the machine with, oops, the whole box of soap, enough to cause the machine to overflow. Oh no, Cube Town is covered in suds, but when the rain washes them away, Cube Town is sparking clean, all thanks to Pecola. Maybe his help isn't so bad after all. ;What started out as a joke on Pecola has become a giant, fire-breathing, vampire Monster Moth! Built by none other than Rudy, Little Chu and Pecola out of Chewy's pedal-copter invention with a few accessories added on. Now, off to provide a little excitement to the citizens of Cube Town, Pecola is pilot and pedaller of the Monster Moth, flying it all around and adding some fancy loops and dives too. Instilling fear and terror in the minds of everyone. It's only when Pecola runs out of steam and is forced to make a crash landing that the myth of the Monster Moth is dispelled. That was more than enough excitement for one day! Aunty Yorkshire always works so hard, it's no wonder she wishes for a little time to herself - maybe a makeover or a poetry reading. When Pecola hears this, he's determined to help. He enlists the help of Papazoni, Hillary and Mr. Lonely to entertain Aunty Yorkshire and promises to take care of her chores. Except Hillary's new look doesn't really suit Aunty Yorkshire and Mr. Lonely's poem only makes her sad. And as usual, Pecola has managed to create more of a mess, even though he did try to clean up. But the mess only makes Aunty Yorkshire happy. After all, working is what she loves best./n;Thanks to Robo-Pecola, Robbie's computer game is now real-life, with Robo-Pecola as Max von Villainator and Robbie himself as the hero, Sir Lanceahop. First the Max steals the sacred flying horses, and then he kidnaps the Fair Maiden and takes her to his evil hideout before planning an attack on Sir Lanceahop's kingdom. The fate of Cube Town is resting on Sir Lanceahop's shoulders. Robbie must overcome his timidity and fear to save the town. Jabatt and Bashatt are very good at running their weekly fire drill, even if they've never actually been called to a real fire. Pecola thinks it would be very cool to be a firefighter. And when he goes to visit the station, Jabatt and Bashatt give him a very important job. He is posted on the roof with a pair of binoculars, assigned to keep an eye out for any emergency and given instructions to sound the siren if he spots one. But Cube Town is a pretty dull place, no emergencies happening here, that is until Pecola starts creating them. Jabatt and Bashatt are busier than they've ever been! By the time Pecola confesses he has manufactured all these emergencies, Jabatt and Bashatt have proven they can handle any situation. ;Rory doesn't think he'll ever win the Mail Carrier of the Month Award. After all, there aren't any obstacles to overcome in delivering the mail, Cube Town has perfect weather all the time. But Pecola and Chewy know just how to help him win the award. Dr. Chu's latest invention, Tornado in a Can, provides an enormous gust through which Rory still manages to deliver the mail. Definitely deserving of an award! Pecola is currently available to watch and stream on Cartoon Network. You can also buy, rent Pecola on demand at Amazon online.